Today, two-thirds of Yemen’s population don't know where their next meal is coming from. The protracted and devastating conflict that began in March 2015 continues to ruin the lives of most Yemenis. A shattered economy, high unemployment and the non-payment of salaries have destroyed incomes and pushed people into debt. Millions of families are left with nothing to live on, experiencing catastrophic food gaps and malnutrition. If nothing is done immediately, the country risks becoming what the UN has described as the worst famine seen in decades. You can help. 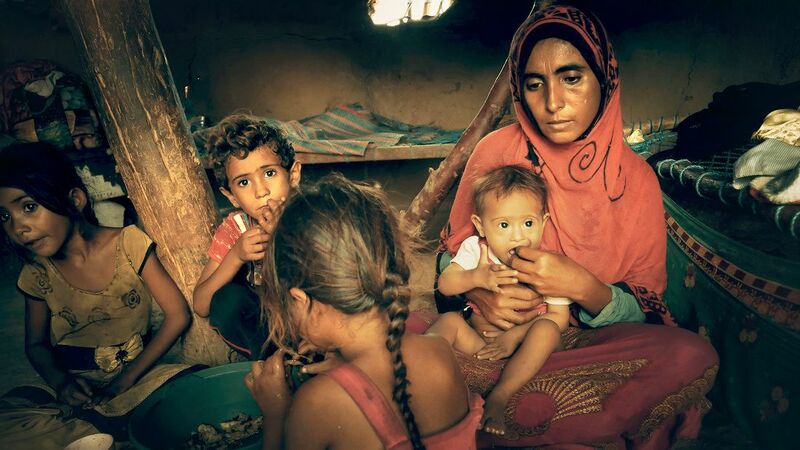 Yemen’s food crisis is a direct, man-made result of the war. Since 2015, the economy has halved, and more than 80% Yemenis now live below the poverty line. The collapse of incomes and increase in prices have pushed food beyond many people’s reach. Besides, as a food-deficient country, Yemen has always been heavily dependent on commercial imports. These have been knowingly undermined by parties to the conflict, causing major disruption to the food pipeline and other supplies. Hunger is rife across the country, even hundreds of miles from the front line. In less than four years, the number of people who are food insecure has risen from 11 million to nearly 20 million. According to the UN, 14 million people – half the population – face a clear and present danger of imminent famine. Families have no choice but to resort to desperate and harmful coping solutions to avert hunger or the looming threat of it. Many reduce the amount of food they eat or even skip meals. They feed what little they have to their children in priority before themselves. Some are also forced to run up debts, send household members to beg or sell their assets to buy food. Women suffer disproportionately from these dramatic levels of food insecurity and malnutrition. They eat last and least, giving priority to children and other family members, or using money for other household needs. They are increasingly struggling to access hospitals and medical services, are further exposed to risks and experience the highest levels of all forms of violence. One-quarter of Yemeni women between the ages of 15 and 49 are acutely malnourished. 2 million pregnant and breastfeeding women are at grave risk of death if famine strikes. 3 million women and girls are at risk of gender-based violence and incidents of violence against women have increased by more than 63 percent over the last two years. Early marriage, already a dire problem in Yemen, has increased again since the escalation of the conflict. Girls as young as eight or 10 years old are married off to reduce the number of family members to feed, but also as a source of income in order to feed the rest of the family and pay off debts. Sanitation: we’re constructing emergency latrines and distributing hygiene kits. Yemen is currently facing the world’s largest food security emergency. This is not a future threat. Without immediate action to tackle this crisis, thousands of people will die, even before famine is declared.